Andrew O. Winckles is Assistant Professor of CORE Curriculum (Interdisciplinary Studies) at Adrian College. Angela Rehbein is Associate Professor of English at West Liberty University. The eighteenth century witnessed the rapid expansion of social, political, religious and literary networks in Great Britain. Increased availability of and access to print combined with the ease with which individuals could correspond across distance ensured that it was easier than ever before for writers to enter into the marketplace of ideas. However, we still lack a complex understanding of how literary networks functioned, what the term ‘network’ means in context, and how women writers in particular adopted and adapted to the creative possibilities of networks. This collection of essays address these issues from a variety of perspectives, arguing that networks not only provided women with access to the literary marketplace, but fundamentally altered how they related to each other, to their literary production, and to the broader social sphere. 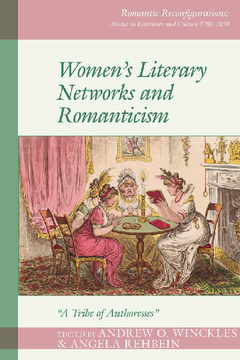 By examining the texts and networks of authors as diverse as Sally Wesley, Elizabeth Hamilton, Susanna Watts, Elizabeth Heyrick, Joanna Baillie, Mary Berry, Mary Russell Mitford, Mary Shelley and Elizabeth Barrett Browning, this volume demonstrates that attention to the scope and influence of women’s literary networks upends long standing assumptions about gender, literary influence and authorial formation during the Romantic period. Furthermore, it suggests that we must rethink what counts as literature in the Romantic period, how we read it, and how we draw the boundaries of Romanticism. Andrew O. Winckles is an Assistant Professor at Adrian College. Angela Rehbein is Associate Professor of English at West Liberty University.